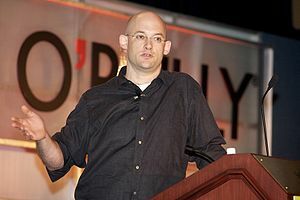 Clay Shirky’s famous soundbite has helped to focus on minds on the way information on the web needs to be tackled and a move towards managing the process of selecting and prioritising information. But in the research space I’m getting a sense that it is fuelling a focus on preventing publication in a way that is analogous to the conventional filtering process involved in peer reviewed publication. Most recently this surfaced at Chronicle of Higher Education, to which there were many responses, Derek Lowe’s being one of the most thought out. But this is not isolated. There is a widely held assumption that putting more research onto the web makes it harder to find the research you are looking for. Publishing more makes discovery easier. The great strength of the web is that you can allow publication of anything at very low marginal cost without limiting the ability of people to find what they are interested in, at least in principle. Discovery mechanisms are good enough, while being a long way from perfect, to make it possible to mostly find what you’re looking for while avoiding what you’re not looking for. Search acts as a remarkable filter over the whole web through making discovery possible for large classes of problem. And high quality search algorithms depend on having a lot of data. It is very easy to say there is too much academic literature – and I do. But the solution which seems to be becoming popular is to argue for an expansion of the traditional peer review process. To prevent stuff getting onto the web in the first place. This is misguided for two important reasons. Firstly it takes the highly inefficient and expensive process of manual curation and attempts to apply it to every piece of research output created. This doesn’t work today and won’t scale as the diversity and sheer number of research outputs increases tomorrow. Secondly it doesn’t take advantage of the nature of the web. They way to do this efficiently is to publish everything at the lowest cost possible, and then enhance the discoverability of work that you think is important. We don’t need publication filters, we need enhanced discovery engines. Publishing is cheap, curation is expensive whether it is applied to filtering or to markup and search enhancement. Filtering before publication worked and was probably the most efficient place to apply the curation effort when the major bottleneck was publication. Value was extracted from the curation process of peer review by using it reduce the costs of layout, editing, and printing through simple printing less. But it created new costs, and invisible opportunity costs where a key piece of information was not made available. Today the major bottleneck is discovery. Of the 500 papers a week I could read, which ones should I read, and which ones just contain a single nugget of information which is all I need? In the Research Information Network study of costs of scholarly communication the largest component of publication creation and use cycle was peer review, followed by the cost of finding the articles to read which represented some 30% of total costs. On the web, the place to put in the curation effort is in enhancing discoverability, in providing me the tools that will identify what I need to read in detail, what I just need to scrape for data, and what I need to bookmark for my methods folder. The problem we have in scholarly publishing is an insistence on applying this print paradigm publication filtering to the web alongside an unhealthy obsession with a publication form, the paper, which is almost designed to make discovery difficult. If I want to understand the whole argument of a paper I need to read it. But if I just want one figure, one number, the details of the methodology then I don’t need to read it, but I still need to be able to find it, and to do so efficiently, and at the right time. Currently scholarly publishers vie for the position of biggest barrier to communication. The stronger the filter the higher the notional quality. But being a pure filter play doesn’t add value because the costs of publication are now low. The value lies in presenting, enhancing, curating the material that is published. If publishers instead vied to identify, markup, and make it easy for the right people to find the right information they would be working with the natural flow of the web. Make it easy for me to find the piece of information, feature work that is particularly interesting or important, re-intepret it so I can understand it coming from a different field, preserve it so that when a technique becomes useful in 20 years the right people can find it. The brand differentiator then becomes which articles you choose to enhance, what kind of markup you do, and how well you do it. All of these are things that publishers already do. And they are services that authors and readers will be willing to pay for. But at the moment the whole business and marketing model is built around filtering, and selling that filter. By impressing people with how much you are throwing away. Trying to stop stuff getting onto the web is futile, inefficient, and expensive. Saving people time and money by helping them find stuff on the web is an established and successful business model both at scale, and in niche areas. Providing credible and respected quality measures is a viable business model.